While working as a caregiver, there is a good chance you will encounter combative patients, or patients who try to harm others or themselves. What do you do in these situations? Each one is different and should be approached cautiously. It is often very difficult, or sometimes impossible, to know when a patient will become combative. They will be fine one moment and then in just a matter of seconds, they snap. You should be extra cautious of people who are known to do this. This is especially common with patients with dementia. Some are what is known as pleasantly confused, which means they will not know who you are or what is going on but will still be kind, while others will become combative. You cannot become angry when this happens. It isn't their fault. I have known them to think that they are at their house and that I am an intruder. Even when I point out to them that they are in a hospital, they often won't believe me. In these situations, you may have to play along. What I mean by that is you may have to start agreeing with what they are saying and change your approach to fit the way they are viewing things at that moment. Doing this can even be fun at times. If you just keep trying to convince them that they are wrong, they may just get more and more frustrated which can make them more violent. Even if you do manage to convince them, they are likely to forget in just a matter of seconds. What do you do if a combative patient does hit you? The answer to that isn't always clear but there are things you should never do. The obvious one is of course to never hit back. This is not only wrong on a moral standpoint, it can lead to losing your job or even a lawsuit. On top of that, it could make the patient even more violent. You also shouldn't yell or curse at them. This will also just anger them further and make the situation worse. Also, if you are in a facility with multiple patients, they may hear what is going on and become upset or frightened. So what should you do if you get hit? Depending on the patient, their hitting may not physically harm you. This is especially true with the elderly or ones who are very sick and weak. With them, just do what you absolutely need to do and try to agitate them as little as possible. 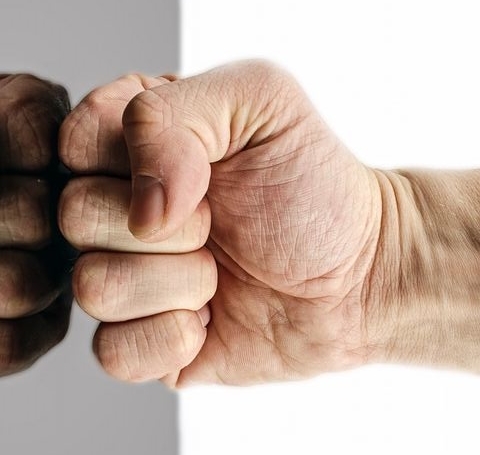 Other combative patients can and will harm you if you are not careful. When they become combative, you should back away from them so they don't keep hitting you. If they are ambulating and they are a fall risk, it is best not to back away, but at the same time, you shouldn't ignore your own safety. If you are doing something such as trying to change their adult diaper, it is a good idea to ask for help. That way one of you can hold their arms and/or legs down while the other does the changing. Just be careful not to accidentally harm them while trying to control their movements. Just stay calm. If they see that you are anxious, it will make them even more anxious. Don't show fear. This is often what they want and may encourage their behavior. Talk in a non-threatening voice. A soothing voice telling them that everything is okay may be the only thing they need to hear. What if the matter gets more serious? What if you really feel threatened and you don't think you can control the situation? The first thing you should do is call for help, whether it be from another coworker, or whoever is able and willing to help keep order. If the two of you are unable to calm them down, and the facility has a security team, don't hesitate to call them. Many facilities even have a special code that can be announced specifically for this. If there is no security team or you are at a house, you can always call the police. There are times, especially if they have a weapon of some sort, that you should just keep your distance. Don't try to be a hero. Wait for someone who is trained for these types of situations. If you try to take the weapon away, they may use it on you before you can grab it. Try your best to keep the patient contained and unable to hurt anybody including yourself. Keep them out of the hallways and other patient's rooms. This can be especially difficult with rooms that aren't private. If necessary, you may have to move everybody else out of the room. In a hospital or similar facility, restraints may be ordered for combative patients. They may seem cruel and inhuman. I personally hate seeing anybody in them, but they can be necessary for the safety of you, the staff, other patients, and even themselves. There absolutely has to be a doctor's order before they can be applied. Never, under any circumstances put them on without an order. This can easily lead to a lawsuit. If they are too strong to put them on safely, call security for assistance. Controlling your actions in confrontational situations is very difficult for some people. If you are one of these people, you either need to get yourself under control immediately, or think about switching careers or finding another caregiver for your loved one. 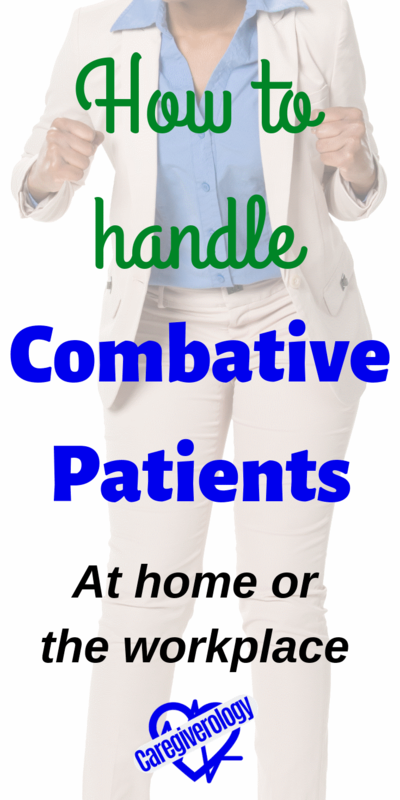 There is never a guarantee that you won't encounter combative patients. You must be able to resist your initial reactions. It isn't worth the risk of getting sued, going to jail, or even worse, harming another human being.